Bar on MLK Dr. and next to Gee’s Clippers is already drawing NBA and NFL players. 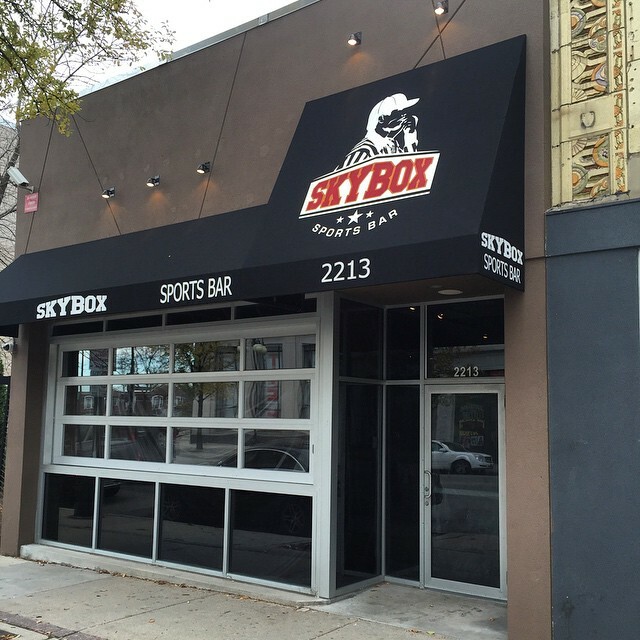 SkyBox Sports Bar. Photo from facebook. 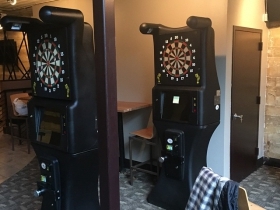 MLK Drive is gaining a new sports bar where locals will be able to enjoy a basketball half-court, arcade games and every televised (including pay-per-view) sporting event available. You may also get to see some sports celebrities hanging out. Gaulien “Gee” Smith from Gee’s Clippers Barber and Beauty Salon is opening SkyBox Sports Bar at 2313 N. MLK Dr., next door to his barber shop. His partners in the venture are Corey Smith, Myron Smith and Mark Wade. “My partners are my brother, my cousin and a friend who I’ve known for about 15-20 years,” he says. 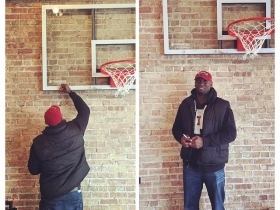 Gee opened his first sports-themed barbershop, at 4323 W. Fond Du Lac Ave., nineteen years ago when he was only 24 years old. In 2006 he opened his second location at 2215 N. MLK Dr., but was forced to close in 2010 after parking issues arose. Now he’s come back to that area for the Skybox. “The city built a parking lot next door to me and so I came back down to the area,” he says. The most recent local professional athletes to pass through SkyBox were Milwaukee Bucks players Brandon Knight and Jerryd Bayless. But the SkyBox Grand Opening (on Black Friday, November 28th, at 6:00 pm) falls on a day the Bucks are on the road. 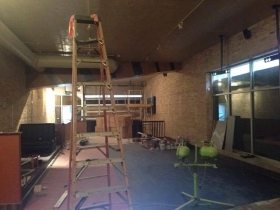 “They will out of town for the grand opening but they’ll definitely be regulars,” Smith says. The centerpiece of the basketball half-court in the SkyBox will be the backboard. 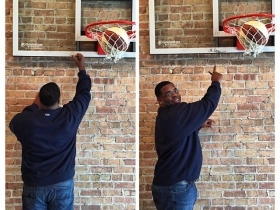 “Every celebrity that comes through we have autograph our backboard and then take pictures for our wall of fame – if you will,” he says. 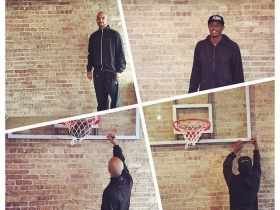 “As of right now we have seven signatures on that backboard before we even open – just to give you an idea of the NBA athletes that come through the doors of Gee’s clippers. We also have signatures from George Koonce who played for the Packers and Tim Terry who played for the Seattle Seahawks and is now employed by the Green Bay Packers. 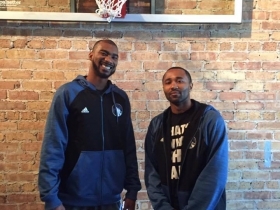 So not only do NBA athletes come through Gee’s Clippers – we have various Milwaukee Brewers and Green Bay Packers and (players from) visiting teams.” Many, he expects, may also stop at the sports bar. The Skybox will offer a small pub-style menu including salads and at least five varieties of specialty wings. The bar will be open seven days a week and lunch will be available every day. Hours are Sunday through Thursday 11:00 a.m. – 12:00 a.m. and Friday and Saturday 11:00 a.m. – 2:00 a.m. I visited this bar with two friends on a Tuesday night. We saw that it was open and spontaneously went in. The entire basement looked loaded with games and activities. We had a great customer service experience too. I definitely would go back. Their beer selection is ordinary. Their Vodka is great. My friends and I are all white and we all had a great time. This can be a great place to bring white and black people together in a happy and fun place. My Sisters and I went to Skybox tonite and had a really good time. Atmosphere was great food was great!!! And people were very friendly. We will most definitely go again. Shout out to Corey Smith who has always Jada great business mind. Thank you for making sure my Sisters and I were well taken care of. Great job to you and your Partners! !